The euro was steady against the dollar on Thursday, with the market seemingly stuck between a rock and a hard place, finishing the day just 0.09% higher at $1.3536. This came as new hopes emerged for a short-term deal to raise the US debt limit and avoid immediate default. The dollar was seemingly unaffected by US initial jobless claims data, which rose by 66,000 to 374,000 last week. The dollar strengthened against the major currencies yesterday as the US budget deadlock began to show signs of promise. The dollar made its largest gains in a month as the EUR/USD pair fell by 0.47%. The increased demand for the dollar came from the Fed minutes which showed that many members of the FOMC were expecting tapering to begin this year. The declines in the single currency came despite economic data from Germany which showed industrial production rising above expectations in August. Little changed for the euro/dollar pair yesterday as the dollar fell in value over the course of the morning before recovering ground during the afternoon. Interestingly, the spread betting charts show that the dollar is continuing to hold up despite the political stalemate weighing it down. With no major economic data being released, the currency markets are remaining relatively quiet, with many investors waiting to see if any ground is made in the US political battle. The forex market remained sluggish on Monday, with the euro drifting lower against the dollar as the government shutdown entered its second week. In addition, Eurozone investor confidence fell to 6.1 on the Sentix index, from 6.5 in September, further hurting the single currency. The September Non-Farm Payroll figures were not released on Friday due to the partial shutdown, taking away vital data from the Fed and making an October taper even more unlikely. 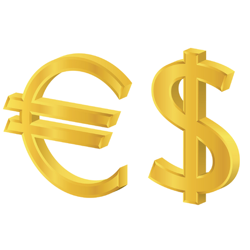 As a result, the euro/dollar slipped lower, trading close to an eight month low. The situation was exacerbated as investors, already unsettled by the impasse, saw weaker than expected Eurozone data which helped to devalue the euro. This meant that the single currency fell by 0.2% to close at $1.3595.